We all share this place. Whether we have feet, fins, or feathers, nature is our home. It’s where we come together and connect. It’s where we find peace. It’s how we survive. Your favorite spot to take a break from the chaos of the day might also be a safe winter home for a bald eagle. When you see a mother bear and her cubs in your backyard, they also are seeing you in theirs. Naturalist John Muir said it best: Everybody needs beauty as well as bread, places to play in and pray in, where nature may heal and give strength to body and soul alike. Our mission at the Delaware Highlands Conservancy is to protect the working farms and forests, clean waters, and wildlife habitat of the Upper Delaware River region. But it goes far beyond that. 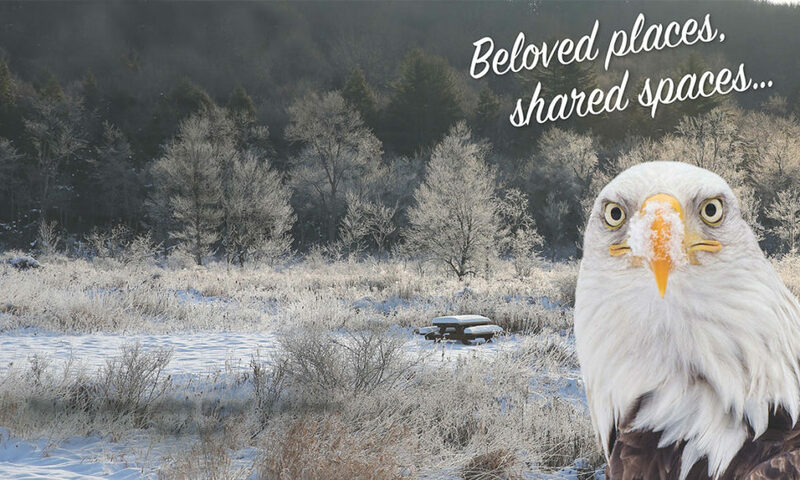 We want to honor your connection to nature and our shared history. To respect the special places where we play; where we reflect; where we heal. Where we live. From our eagle-viewing bus tours to guided hikes, forestry workshops, and river paddles, we offer these programs throughout the year so we can all meet each other in the space that we share—people and wildlife alike. We all need the same things to survive and thrive: clean water, clean air, healthy food. And space. Your year-end gift to the Conservancy is an investment in the way of life that we cherish. You read in our autumn newsletter about some of the accomplishments you made possible in 2017. Together, we’ve protected nearly 15,000 acres of lands and waters in Upper Delaware River region, and welcomed thousands of people of all ages to our educational programs. But you’re not investing in the protection of 15,000 acres. You’re investing in the forest trail you’ve walked since you were a child. You’re investing in the little girl who has just seen a bald eagle for the first time—and the eagle that has just seen her. You’re investing in the stream in your backyard that eventually winds into the Delaware River, and the farm down the road where you buy your vegetables. Your gift protects these special places today and for future generations. Please consider a gift of $100 or more today. If you are able to consider a significantly larger gift, please be as generous as possible. If $100 is not possible, please consider an amount that is more comfortable for you. No gift is too small to make a difference! Thank you. We are truly grateful to share this beautiful and healthy home with you, and to care for it together. From all of us at the Delaware Highlands Conservancy, we wish you a wonderful holiday season and new year. Photographs courtesy of David B. Soete and Stephen Davis.